Historical relics and monuments indicate the people’s national identity, traditions and cultural belongings and their protection is the duty of each citizen of the country. Recently, a jihadi figure names Mohammad Saeed Soufizada has prevented a number of individuals who were attempting to smuggle a vehicle related to kingdom family. Based upon the situation, to better protect the vehicle, Mohammad Saeed transferred that to Panjshir province and finally on Qaus 27, 1397, during a special ceremony, Chief Executive Dr. Abdullah Abdullah along with a number of high ranking government officials and deputy ministers of information and culture handed over the vehicle to the National Museum. During the ceremony, CE Dr. Abdullah said Mohammad Saeed has kept the vehicle as a national honesty. 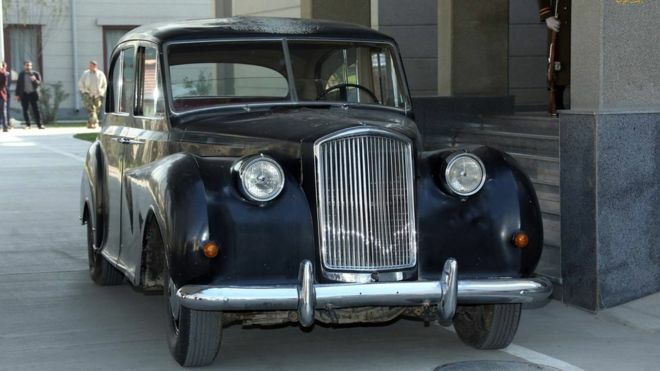 He pointed out that the vehicle had been brought to Afghanistan for royal family seventy years ago, adding we hope to see other people who kept the historical relics with them to hand them over to Afghanistan’s national museum. In the ceremony, the national museum’s in-charges declared that currently, three vehicles and four carriages belonging to Amanullah Khan era are being kept in the museum. CE Abdullah said I remembered that high prices had been offered to Commander Mohammad Saeed for the vehicle, but he as a patriotic citizen rejected the offers and kept that as honesty. During the ceremony, deputy cultural minister Pro. Mohammad Rassoul Bawary said those who loved their homeland leave the materials and prefer the spirituals instead and Commander Mohmmad Saeed is a good example of that. During the domestic wars, most of cultural and historical relics had been transferred to abroad and hundreds of national museum relics had been looted. In fact, historical relics are among the Afghans’ prides, as currently, Bakhtar Treasury Exhibition is held in China, through which Afghanistan earns much revenue.